Twill is an ancient weaving technique used to produce durable fabrics that have characteristically diagonal patterns called "wales." Twill fabrics are woven on looms using three or (more typically) four harnesses-frames with "heddles" (loops of string or wire) that hold individual warp yarns in place and are used to lift up every third or fourth warp yarn in a repeated pattern. On a four-harness loom, the weaver can alternatively lift up sets of two harnesses at once (1+2, 2+3, 3+4, …). This creates an even sturdier and more balanced twill weave. Because the filling and warp yarns in a twill weave do not interlace as many times as they do in a plain weave, the yarns can be packed more tightly together. This makes the fabric stronger, thicker, and better able to hide soil than a plain weave made from the same materials. It also gives the fabric a better drape and resistance to wrinkling. Lightweight twills are commonly used for dresses, scarves, and neckties. Heavier weights are used for blue jeans, jackets, and outerwear for work such as carpentry and construction. Elegant variations of twill weave, including houndstooth and herringbone, are used for high-quality professional clothing. Lightweight twill fabrics for men's neckties are commonly called foulard or surah. Foulard is literally the French word for a necktie or scarf. These fabrics are made of silk or a manufactured material such as polyester. They can also be used for lingerie, slip dresses, or linings in other garments. Although the fabric is thin, the strength of a twill weave makes the final product fairly durable. Challis is a light-to medium-weight twill made of wool or rayon. This fabric has a luxurious drape, is resistant to wrinkling, and is often used for women's apparel. A heavier twill known as serge has a smooth surface and is frequently used for stylish outerwear such as trench coats. Thicker versions made of wool and cotton are used for work clothing. Serge de Nîmes (serge from the city of Nîmes in southern France) was, some argue, the original name of denim, the heavy cotton twill now used for blue jeans. Levi Strauss, the inventor of blue jeans, was initially using tent canvas (a plain weave), but switched to denim because of its superior strength. For similar reasons, in 1908 the U.S. Army began to issue soldiers denim work uniforms. These were popular and widely used until they were phased out during World War II. Denim generally has blue cotton yarns (dyed with indigo) in one direction and white cotton yarns in the other direction. A cheaper version can be made by substituting polyester for the white yarns.) This color difference emphasizes the diagonal wales of the cloth and gives denim its characteristically worn look. 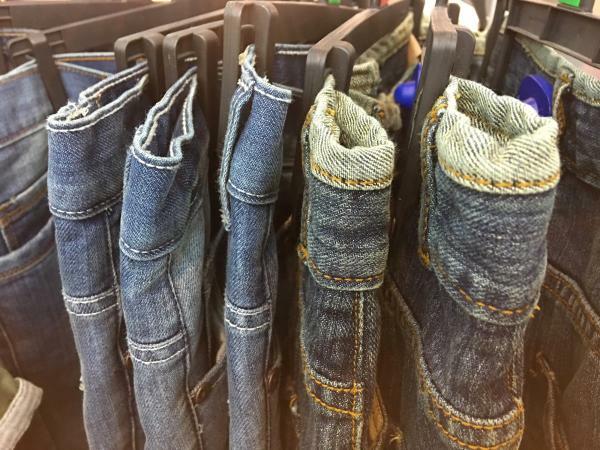 Trendier versions of denim can be woven with other colors of thread or dyed later as a whole garment. The strength of denim allows the garment to undergo harsh finishing treatments such as acid-and stonewashing, abrasion, and slashing. A lighter fabric that looks very similar is known as jean and is often used for casual button-down shirts, children's clothing, and home furnishings. Other twill weaves that are frequently made into work clothing include drill (a heavy cotton fabric), cavalry twill (a smooth wool fabric with distinct diagonal lines), and chino (a relatively lightweight cotton fabric). Chino had its origins as a material for summer-weight military uniforms during World War I. Popularized by "casual Fridays" as well as Gap advertisements in the late 1990s, chino became a popular choice of fabric for casual pants, capris, and skirts. It was also part of the "Ivy League look" in the 1950s and early 1960s. Gabardine, an elegant material made from wool instead of cotton, is a common choice for professional suits and dress slacks. This fabric has distinct diagonal wales created by using many more warp threads per inch than filling threads. Different colors of thread in the warp and filling, such as brown and camel, can emphasize these lines further. As with plain weave, there are many ways to alter the structure and appearance of a twill weave. Houndstooth is a classic twill fabric with a small, distinctive pattern that looks like a four-pointed star. This is created by alternating two different colors of warp and filling threads, often black and white to emphasize the pattern. Herringbone twills have diagonal lines that periodically change direction, creating zigzag patterns that look like subtle stripes from a distance. This pattern is made by changing either how the harnesses are threaded or the order in which they are lifted. 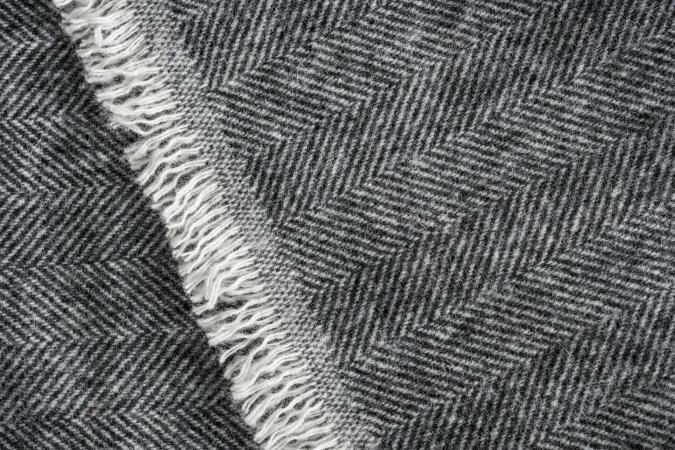 Herringbone twills are generally made from smooth, medium-weight wool yarns and are used for professional clothing. Other decorative twills that do not have specific names are called broken twills, pointed twills, or undulating twills. These patterns are created by using more harnesses and more complex systems of threading and of lifting the harnesses. Textile designers have an almost unlimited number of ways to change a twill pattern. These fancy twills are not very common and are generally used for either expensive home furnishings or couture apparel. See also Cotton; Denim; Gabardine; Indigo; Jeans; Levi Strauss & Co.; Neckties and Neckwear; Polyester; Rayon; Silk; Plain Weave; Satin Weave; Wool. American Fabrics and Fashion editors. Encyclopedia of Textiles, 3rd ed. Englewood Cliffs, N.J: Prentice-Hall, Inc., 1980. Emerson, William K. Encyclopedia of United States Army Insignia and Uniforms. Norman: University of Oklahoma Press, 1996. Finlayson, Iain. Denim: An American Legend. New York: Simon and Schuster, Inc., 1990. Kadolph, Sara J., and Anna L. Langford. Textiles. 9th ed. Upper Saddle River, N.J: Prentice-Hall, Inc., 2001. Oelsner, G. Hermann, and Samuel S. Dale, eds. A Handbook of Weaves. Mineola, N.Y: Dover Publications, 1990. Original edition published in 1875.